Hey, it’s going to snow and be miserable. Distract yourself with lovely music! 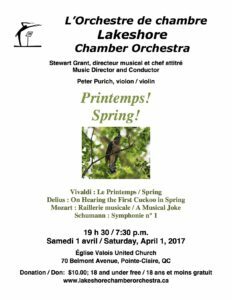 The Lakeshore Chamber Orchestra’s 2017 fall concert will be presented at 7:30 PM Saturday 25 November, at our home base of Valois United Church (70 Belmont Ave. Pointe-Claire, between King and Queen). The theme of this concert is the 3Bs: Bach, Beethoven, and Brahms. Our young keyboard soloist is the winner of a local competition, as usual. He’s brilliant. And I’m not going to tell you what kind of keyboard he’ll be playing, because the surprise will be fun. Admission is $10, free for children 18 and under. The concerts usually last around two hours, including the refreshment break. The address and map are on the church website. Children of all ages are very welcome. This entry was posted in Diary, Music, Words Words Words on November 9, 2017 by Autumn. When we last left Sparky on his resumed cello journey in January after two and a half years of hiatus, he had just started playing on a borrowed cello that needed work. One thing led to another, and we didn’t get it into the shop till a couple of weeks ago. Readers, it’s dead. The strings buzzing on the fingerboard had gotten worse, to the point where he couldn’t play anything with the first finger in first position on any string. We thought raising the nut would solve it, which is a pretty straightforward and relatively inexpensive fix. He was doing a fantastic job playing through the sour notes, but as we all know, a bad tool creates obstacles that require energy to work around that could be better invested. The luthier took a quick look at it and said there wasn’t much she could do. The neck was warped backward, and to bring the fingerboard down to playable level plus add the necessary scoop would thin it out to a point where it would be thinner than a violin fingerboard. It would be very delicate. On top of that, without the stabilizing strength of a proper fingerboard of the usual cello thickness, the neck could very easily start to warp the other way. In essence, she said she could do the repairs… it just wouldn’t be worth the money. Sparky began trembling and tears started slipping down his face. He had somehow bonded with this thing, which was somewhat disturbing because it was borderline abusive to him. (Passive abusive, but whatever.) I think part of him worried that this was it, he’d have no cello and would have to stop after he’d made the decision to start again and really apply himself. When I thought about it later, I wondered if he had embraced the imperfections because they would limit him by necessity; he wouldn’t have to worry so hard about doing everything correctly because there would always be this imperfection inherent in the instrument that made him feel safer somehow, and less stressed. Or maybe he felt a kinship with the imperfection. I don’t know. Anyway, he randomly teared up about it now and then about it over the next few days; no amount of reassurance seemed to get through to him. I pinged a Kijiji listing for a 3/4 cello in the city, made an appointment, and we went to see it this past Saturday after our lesson. The guy selling it was studying music at university; he had a zillion guitar cases in his room, and this little cello that had been his as a teenager. It looks like it has been in the wars; it was secondhand when he got it, and it has all the bangs and nicks a school instrument would have. It has a crack or two, one repaired and one in limbo, but nothing horrendous from what I could tell. The neck was straight (ha, I checked, trust me). It didn’t come with a bow, but I have a fiberglass 3/4 bow left over from my first cello he can use until we get a new one. And coincidentally, this one seems about the same age, with the same clunky style of endpin mine had and a really old similar canvas case (sized for a 4/4 and way too big). We came home with it. It’s nothing spectacular, but it’s easy to play even in the high positions, and it makes all the sounds it’s supposed to make, which is definitely an improvement. I paid under what he had listed it for and still probably too much for it, but Sparky was starry-eyed, and the university kid was just terrific; and if he was studying music probably needed the money. I ordered a new set of strings (I think the set on it are cheap originals, yikes; they’re pretty dead) and a proper sized case. Sparky spent the first five minutes of his next practice session just blissfully playing the notes the last cello had choked. When I asked him what he was going to call this one, he said Oak. And he retroactively named the other one Buzz, which made me laugh. Other than the limitations of the cello, he’s been doing great work. He’s progressing quickly through the pieces in the book, which I know is doing a lot for his self-confidence. At the rate he’s going, he’ll start the second book in the fall when lessons resume. He has chosen his recital piece (Rigadoon! ), he works diligently on the hard bits of his part for the group pieces, and after I help him tune and review the homework notes I took during his lesson, I walk away and he directs his own practice. I’m proud of him. Hopefully with this new-to-him instrument, things will go even better. This entry was posted in Cello, Diary, Music, The Boy, Words Words Words on April 11, 2017 by Autumn. Half-metre of storm snow and impassable streets aside, it’s spring next week. And we are preparing a concert for you! The concert will take place at our home base, Valois United Church (70 Belmont Ave, Pointe-Claire, between King and Queen). Admission is $10, free for children 18 and under. The concerts usually last just about two hours, including the refreshment break. The address and map are on the church website. Children of all ages are very welcome. This entry was posted in Cello, Music, Words Words Words on March 17, 2017 by Autumn.